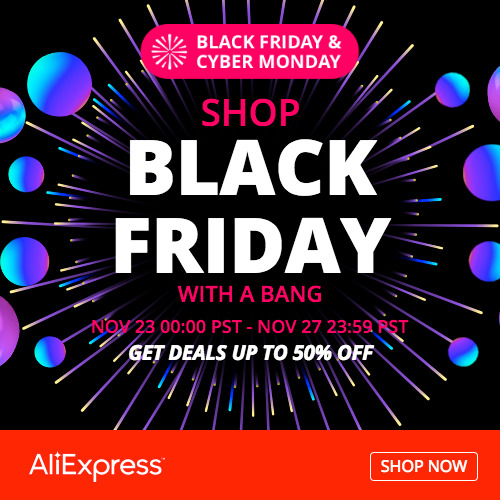 BLACK FRIDAY is here and we have gathered all the best deals and coupons for this Black Friday 2018 at Aliexpress, Gearbest and Banggood. If, instead, you want the Best Amazon Black Friday 2018 Deals and Coupons you can get them by clicking HERE. This year the BLACK FRIDAY Sale is combined with CYBER MONDAY and will last up to the 27th November @23:59hs on some e-shops. For Cyber Monday 2018 Coupons visit this page. The BLACK FRIDAY Deals and Coupons have a time validity and limited number available. For this reason, if you see a deal or coupon that is interesting to you, grab it! Be sure to re-visit this page several times a day to check for new coupons, freshly published. Through out the Black Friday Sale period we constantly publish new coupons offered by the sellers. Enjoy the BLACK FRIDAY SALE and get the best deals! To find all our Aliexpress Exclusive Coupons get to our dedicated Aliexpress Coupons Page.